You want some menial job automated? Some research-y task done? Parse some CSV files, do something with the data? Batch process? Well why not use the language already know instead of learning bash, shell, php scripting or whatever? Grab the latest version from https://nodejs.org/en/download/current/ and let's go! You should see the version of the Node you just installed displayed in the terminal. Now let's create the simplest script and make sure it works. __dirname is useful when you have for example a bunch of files you want to fiddle with in a subdirectory. You don't want to limit where your script can be run from. So it's best to avoid relative paths but always start with __dirname. Now, imagine you need a script that does something with a list of files you conveniently put in data subdirectory together with your script. 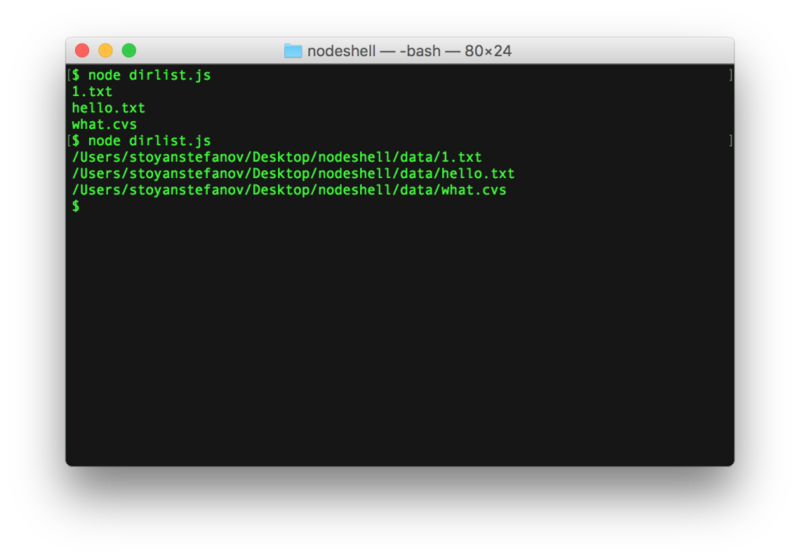 Let's list all the files in this directory using a new script you can call dirlist.js. You start by including two libraries (modules): fs (as in "file system") ans path. 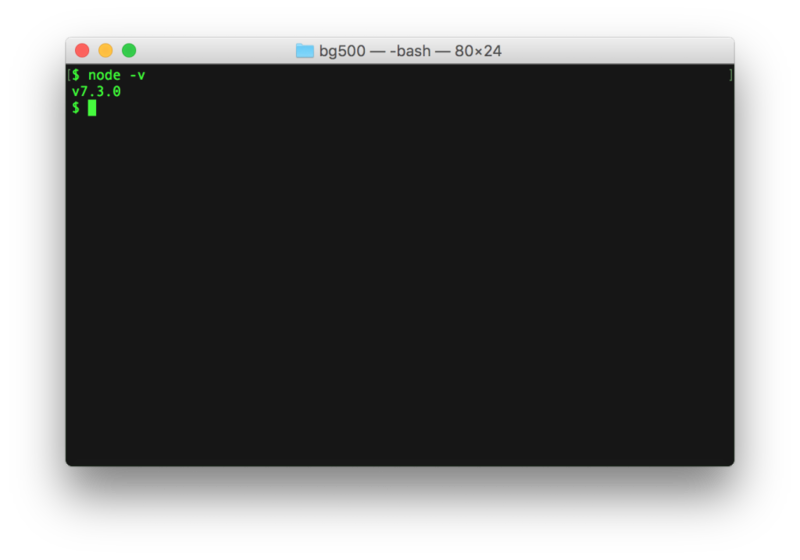 path helps you deal with differences in Windows vs Unix slashes and backslashes and so on. It's alwayts best if you avoid string concatenation and use path's methods instead to make your scripts more reusable and resilient. fs gives you a number of methods to read, write, delete files and directories. For the purpose of listing a directory you can use fs.readdir or fs.readdirSync. Let's go with the second. Why? Well, it's simpler. You'll notice several methods have synchonous and asynchronous versions. The async versions are definitely better because they don't block your scripts with one-after-the-other synchronous operations. They tend to make your scripts run faster because you can do several things in parallel. However they are a bit more complicated because you need to provide a callback function to be notified when the async operation is complete. To keep things simple, sync all the way! Using resolve you can concatenate the current directory and the data subdirectory without any backslashes, etc. Now, reading the directory gives you an array and you can simply print the name of each file in the directory in a forEach loop. How about removing the moar-data directory from the list? You only care about files. There's a stat() method in the fs module that can help here. More specifically, the sync version, statSync(). Tip: stats.size gives you file size. And what if this script only works with text files? Your friend is path.extname(file). Tip: explore what path.parse() can do for you. E.g. 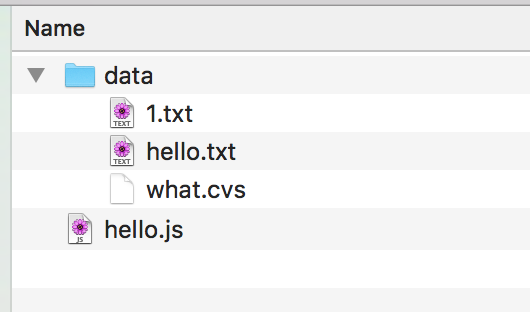 What if the subdirectory moar-data contains additional files you're interested in? Let's list your main directory and its subdirectories and their subdirectories. In other words, list recursively. All you need to do is put your forEach loop into a function listFiles so it an be reused. This function takes any directory as input (listFiles(dir)), lists it and if it finds that one of the items in the list is another directory (stats.isDirectory()) it navigates into the new directory, instead of ignoring it like before. There's a global `process` that can give such vital advise as: "what is the Current Working Directory"
Another thing hanging off `process` is `exit()` which kills the execution of the current script. You can also provide exit codes in case your script A is run by another script B and B wants to know whether A managed to finish successfully. Generally exit code 0 means all is fine, 1 and above is an error. Reading JSON files is as simple as just require()-ing them. When you require a JSON file, it's read, parsed (e.g. with JSON.parse()) and the JS object is returned to you. "Sung with no (instrumental) accompaniment, has lots of harmonizing"
While reading some JSON files (example above) you notice that they contain arrays (rows) and each row's second element (index 1) is lowercase. How about updating all these JSON files and capitalizing the first letter? 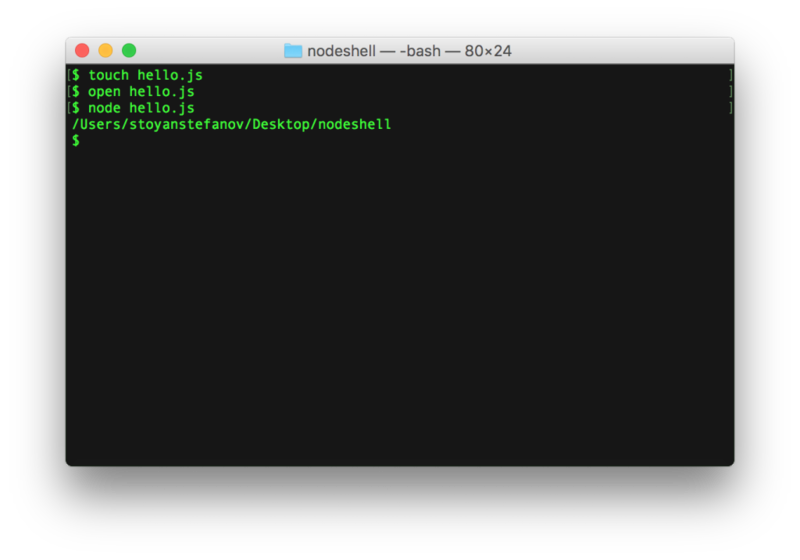 $ node arg.js hello "hi there"
For example you can require the user to provide you with 2 arguments or refuse to do anything otherwise. As you can see, any quotes are conveniently gone. Printing out text with special escape codes can produce output with different background or foreground colors, underline, bold, blink... Let's see an example. These weird characters surrounding the words Error and Success were ANSI escape code, you can learn a lot more about what they mean and how to use them here. Entries (RSS) and Comments (RSS). 24 queries. 0.616 seconds.